This article outlines the construction of the Sonosub, a low cost subwoofer, complete with power amplifier. This projects started out as a subwoofer for my home theater (HT). After I started working on it, I decided against having yet another box in the room so I decided to give it to my brother for his HT system. Along the way I learned a few things about working with tubular enclosures. 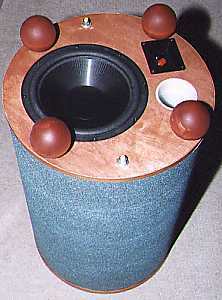 While the results were ultimately satisfactory, several mistakes were made during construction that could have made the subwoofer better than it is. This article describes both what I did as well as what I probably should have done. Learning often means making mistakes and I don't mind making them if it means I will avoid them the next time around. Hopefully, readers will benefit from my mistakes as well by extracting those aspects of the design they find useful, and ignoring the questionable parts. For the curious, here's what everything looked like at the end. During part of 1998, Madisound sold a driver named the INF-10 at a mere $34 USD. These are 10 inch drivers manufactured by Infinity Systems. During this time, I became interested in the construction of cylindrical speaker enclosures. 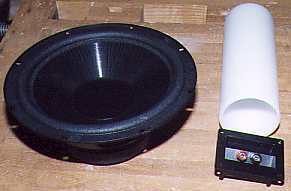 Subwoofers made from Sonotube, a commercial cardboard tube made for pouring concrete footings, are fairly popular with the DIY speaker crowd due to their low cost, simplicity, and high performance. I decided that the INF-10 driver would be perfect for a low cost tubular subwoofer. For more information on Sonotube subs, check out the Sonotube FAQ by Gordon McGill. As with all my projects, I start with a list of goals which then guides my design. Low cost. When I started this project, I didn't have a real need for another subwoofer as I already have a pair of subs utilizing the NHT 1259. But since my subs are wired to my main speakers (left/right), I figured this sub could be connected to the subwoofer output of my Pro-Logic decoder. Since this was targeted at home theater use and not for high fidelity, I was willing to sacrifice some quality for cost. Easy to build. Nothing overly fancy. A tube is about as simple as it gets, though it turned out to be more difficult to work with than I had anticipated. This may have been partly due to the 1/2 inch tube I used instead of the typical 1/4 inch tube. The need to provide an appealing finish also affected the construction steps, making assembly more difficult. Use existing parts where possible. If you like making stuff, you know what I mean when I say that I always seem to have "stuff lying around" waiting to be used. This goal is also consistent with #1 above. Low end extension to at least 30 Hz. This is, after all, a subwoofer, so let's make sure it sounds like one. Amplifier and crossover electronics. Can't forget this. In keeping with goal #1, the original intent was to use a pair of National Semiconductor LM-12 high power op-amps in bridged mode. I already had a pair... somewhere. All I had to do was build a multiple-input, variable gain, variable frequency, low-pass crossover and preamp to drive the LM-12s. This idea was eventually scrubbed in favor of a Parapix amplifer from Apex Jr. The Parapix solution was not only cheaper but required much less work on my part. Downward firing. 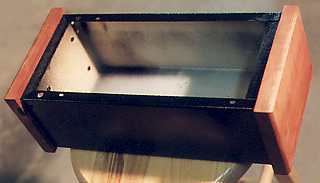 A downwards firing subwoofer has some advantages and disadvantages over a forward firing sub. In this case, firing down made sense due to the use of the tube. It also meant not having to worry about grills or prodding fingers from kids (hopefully). Not all drivers should be used in a downwards firing position, as this will cause cone sag over time. How the INF-10 will fare over time, I don't know. Decent SPL capabilities. It needs to have enough output to enjoy movies. Here are the specs for the INF-10 as published by Madisound. I did not measure the actual driver used. For more information on the INF-10 driver, see Steve Houlihan's and Brian Steele's web sites. Using the above guidelines, I assembled parts for the Sonosub from various sources. Many of the items were things I already had on-hand (goal #3). Other parts came from the local surplus/recycled materials dealer. Funiture grade plywood in varying sizes averaging 2 ft square. These also came from the same surplus dealer. Both sides are veneered with what looks like birch, with an 'A' side and a 'B' side. Thickness is roughly 3/4 inch though it varied from sample to sample. Cost : $2.00 per sheet, 2 sheets used. Particle board, 5/8 inch thick. I had remnants of a 2 ft x 4 ft sheet originally intended for some long-forgotten project. There was enough for one round endcap. Cost : ? Construction grade plywood, 3/4 inch thick. More remnants. Cost : ? 3/8 inch thick cherry veneered plywood. Yet more remnants. Cost : ? Roofing felt. Leftovers. Cost : ? 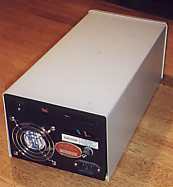 An INF-10 driver. Cost : $34, not including s&h. A terminal cup. I already had one. Cost : ? 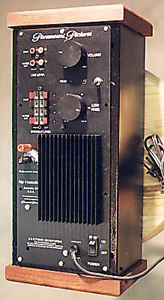 Parapix amplifer, with transformer and wiring connector. At $39.00, this was a much cheaper and simpler solution than building my own LM-12 amplifier. The transformer for the LM-12s would have easily cost $20.00 or more and I would still have a lot of work to do. With shipping and other charges, the final cost : $49.00. Note that as of this writing, the Parapix amplifier is sold out and no longer available from Apex Jr.
Total cost is $131.00 of the above itemized goods; darn good for both a subwoofer and amplifer. Cost could easily have been reduced further by changing the appearance of the unit - use latex paint instead of the Stone Creations; use simple wooden blocks for feet, etc. Below are the notes I took during construction, plus any tidbits added via hindsight. The steps are not the most streamlined but represent the actual steps taken; not the optimal ones. This gives the feel of what was actually done. Note - in all cutting and milling steps, remember to account for the "good" side of the stock. Most woodworking operations have a higher risk of tearing or damaging one surfaces than the other. Properly orienting the stock can minimize damage to the important surfaces. Cut down the tube to the desired length of 24-1/4 inches. Scribe a line around the tube and cut it with a jigsaw. Cut from one or both ends of the tube so that any deformation of the tube (likely near the ends where it's weaker) is cut off leaving the rounder center portion. Cleaned up the edge as needed. The tube has an inside diameter of 16 inches. The tube's wall thickness is 1/2 inch. Each endcap consists of an inner 16 inch diameter insert and an outer 17 inch diameter cap. Mill two 16 inch diameter round inserts. I made one from plywood and one from particle board; it's what I had on-hand. These must fit snugly inside the tube. Don't assume the tube is exactly 16 inches in diameter. Make the inserts to fit, not to what it should be. To determine the actual inside diameter, I took masking tape, taped a circle inside the tube until it overlapped itself, marked the tape where it overlapped, removed it and measured it with a tape measure. This gave me the exact circumference. Divide the circumference by pi and get the diameter. In retrospect, my use of cheap plywood was a bad idea. While it satisfied my goal of using up stuff I already had, it lowered the quality of the top endcap. See the section on results. Mill the two outer round pieces from cabinet grade plywood. One is the baffle (bottom) the other is the top. I made them 17 inches in diameter to cover the 1/2 inch thick tube walls. I should have made them larger so that they stand a little proud of the walls. This would help hide any irregularity between the endcaps and the tube wall. We now have one small and one large circle for both the top and bottom. My circle cutting jig uses a 1/4 inch hole as the center pivot point. This lets me use a 1/4 inch dowel to align each pair of circles at their centers. Pick one of the outer pieces to be the top - probably the better looking one; put that one aside. Align and two bottom pieces together to make the baffle. I used regular yellow wood glue. Clamp and let dry overnight. I used two 3/8 inch diameter metal rods to secure the two endcaps to the tube and to one-another. Having rods means that the top and bottom should be aligned relative to each other. Mark a line on both ends of the tube. Make sure these marks form a line that is perpendicular to the top and bottom circular plane. Align the top's inner (smaller) circle with the glued up bottom assembly and temporarily clamp in place. Drill from the baffle side (to avoid splitting the good outside surface) a 3/8 inch hole through all layers. I used a drill press to get a nice perpendicular hole. Use a brad point bit to minimize damaging the entry hole. My holes were 1-1/4 inches from the outer edge of the baffle. Make sure to place the holes to avoid obstructions with the driver, port, tube, etc. On the bottom baffle, the rods stick out and that's ok. On the top, they can't stick out for aesthetic reasons. The nuts on the top endcap must therefore be hidden between the top two circles (which is why they've not been glued together yet). 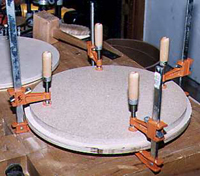 Remove the top's inner (small) circle from the clamps. Now clamp it to the top's outer (larger) circle and mark the center of the 3/8 inch holes on the outer circle. Use another 1/4 inch dowel for alignment. It's probably a good idea to label the 2 rods, especially if they are not exactly opposite each other on a diameter. I marked all holes with a "1" and "2". Mill a recess between the two circles that make up the top endcap. The nuts for the rods will be hidden here. On the top's inner (smaller) circle, use a 1-1/4 inch diameter Forstner bit to drill a recess about halfway into the plywood. This is on the side that will meets the top's outer circle. The recess must be wide enough to handle a flat washer. On the top's outer circle, use a 3/4 inch forstner bit to do the same, using the previously marked center as a guide. This recess is narrower since it only has to conceal the 3/8 inch nut, not the washer. The total depth of both recesses must hold a flat washer, lock washer and nut. Since the top's smaller circle is now thinner at the hole due to the recess, I added reinforcement. I glued an additional layer of plywood to the inside plywood face and drilled a 3/8 inch hole through it. Cut down the steel rods to the desired length. I did a dry fit of everthing to get just the right length. I used a hacksaw, and filed the rough end smooth for safety. If cutting the rod leaves that end unusable for threading a nut and you can't fix it with a grinder, insert a nut, lock washer and washer from the other end. The bad end will be the end that's enclosed between the two top circles and will remain unseen and unused. Thread the rod from the top, through the top's small circle. From the other side, add another washer, lock washer, and nut. Tighten the nuts such that the top nut assembly fits in the cavity previously drilled. With both rods in place and secured, the top's larger circle can be aligned with the smaller circle and the recesses milled into it should cover the protruding 3/8 inch nuts. If the recesses are too small, take out the drill and recess deeper, being careful not to cut through to the other side. Align, glue and clamp the two top pieces together. What I forgot to do is to fill the void around the nuts assembly with filler - silicone caulk would have worked. I didn't realize this until much later and it was too late to take the assembly apart. Drill 3/8 inch hole over the 1/4 inch dowel that's sticking out of the top piece (outside face). Make 3/8 inch plug from the appropriate wood using a plug cutter to plug the hole. This step is purely for looks. Add 6 layers of roofing felt on the inside of the top assembly. These are held by caulk and a few screws. This adds additional damping on the surface directly opposite the driver. Total thickness is about 3/8 inch. Why 6 layers you ask ? Because that's what I had on-hand ! What I should have done was to attach bracing to the top endcap to stiffen it. Then attach the roofing felt to any remaining flat surfaces. This is probably the single most important step I omitted during construction. The top assembly is now done. Complete the bottom endcap (the baffle). Now it's time to work on the bottom endcap, which is also the baffle. Plan the placement of the driver, port, terminal cup, bracing and feet onto the baffle. Route a circle into the baffle for the driver's flange. This is 10-1/8 inch in diameter and 3/16 inch deep. The depth allows for a gasket to be added. Route the driver opening.This is 9 inch in diameter. For safety, do this in multiple passes, leaving about 1/4 inch at the bottom. Remove the remaining 1/4 inch with jigsaw for safety. 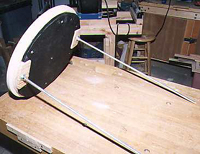 Mill 3-5/16 inch diameter hole for the plastic port using a T-shaped circle cutter on a drill press. Like the driver opening, cut as far down as possible without going through, remove remainder with jigsaw. Cut a 2-7/8 x 2-1/8 inch opening for a rectangular terminal cup. Do this with a jigsaw. Glue and screw a hardwood bar on the inside of the baffle. This bracing helps stiffen the baffle, compensating for the loss of so much material that's been removed. Depending on the layout of holes on the baffle, there may not be room for any bracing, or multiple braces may have to be used. The particle board I used was pretty good material. Void-free plywood would have been structurally stronger. Add alignment marks to both the top and bottom endcap assemblies. These will be used to align top and bottom with the mark on the tube. Work on the cardboard tube. The cardboard tube's outer skin is a spiral layer of thick paper/cardboard. Each winding of the spiral overlaps the previous one by a little bit. To make the tube completely smooth, these overlapping regions must be made flush with the rest of the tube. Shave (with a block plane) the overlapping regions of the cardboard tube. Sand as needed. Use vinyl spackle to patch up all rough areas and other dinks, scratches, etc. (this was after all a surplus tube). Sand the result to 220 grit sandpaper. Prime the exterior tube surface with a spray primer. Spray the exterior with 2 cans of Rustoleum's Stone Creations (greenish tint). Seal with one can of Rustoleum American Accent matte finish clearcoat. At this point, I evaluated the appearance of the endcaps. The top was furniture grade plywood, but I wanted a cherry look to better contrast with the granite green finish of the tube. The veneer was birch, and when I applied a cherry stain, it looked horrible. So I decided to add another layer of cherry veneer plywood I already had. Glue 3/8 inch thick cherry veneered plywood to the top endcap. Use a router with a pattern following bit to cut the plywood flush with the existing endcap. For the exposed edges, apply cherry edge banding to both endcaps. This is an iron-on strip of real wood veneer with pre-applied, heat activated glue. Applied Watco Danish oil to cherry surfaces. Topcoat with a thin layer of wax. Glue the plastic port tube to the bottom endcap/baffle using RooClear plastic glue. Attach two wires from the inside of the terminal cup. Solder connectors to the driver ends of the wires to allow easy connect/disconnect to/from the driver. Mount the rectangular terminal cup to bottom endcap/baffle with four screws. Use a small amount of rope caulk to give it a good seat in the hole. Connect the endcaps to the tube. On the first pass, I used rope caulk to seal the endcap/tube interface. Later I glued the tube to the endcaps making it effectively impossible to disassemble the unit without destroying something. Add a flat washer, lock washer and tighten the nuts on the rods. To raise the unit off the ground (after all, this is a downward firing sub) I made feet out of 4 hardwood balls. These have a flat part and are sold as doll heads in craft stores (they may also be sold for other purposes). The ones I used are 3 inches in diameter. To mount the flat part of the ball to the baffle, I made a drilling jig. I drilled a 3/8 inch diameter hole through a block of scrap wood to make the jig. The purpose of the jig is to guide a drill bit perpendicularly into the ball. Locate the center of each ball's flat area. Position the hole of the jig over the center of each foot and using the jig as a drilling guide, drill a 3/8 inch diameter hole about 1-1/2 inch deep hole into each ball. Cut four lengths of 3/8 inch threaded rod from stock left-over from the main conneting rods. These should be long enough to go from the balls, through the baffle, and stick out the other side with clearance for a flat washer, lock washer and nut assembly. Epoxy a piece of 3/8 inch threaded rod into each ball. To locate the four feet accurately on the baffle, I made another jig. This was 2 pieces of wood, half-lapped onto one-another at right angle (makes a large '+' sign). I marked off the radius from the center of the jig and moved the jig about the baffle until all four sides were equi-distant from the center based on the markings. Mount and secure the feet with a flat washer, lock washer and nut on the inside of the tube. Reach in through the driver opening to do this. Vaccum out the interior in case there's debris still hiding in there. Mount driver to the baffle. The supplied gasket is pretty useless so use rope caulk. Connect the wiring, then screw the driver down. As noted in the results section below, there was excessive vibration on the tube and top endcap. I decided to take the tube assembly apart and try and damp out the vibration without having to rebuild the endcaps. I added a layer of 6 lb carpet padding to the inside surface of the tube. This was glued in place. The tube was then glued to the endcaps with Liquid Nails construction adhesive. The best place to obtain infomation on the Parapix amp is on the Apex Jr. web page. I used a 48 VCT 3 Amp transformer, which mounted directly to the component side of the Parapix faceplate on two of the existing mouting holes. For the power wiring harness, I connected five of the six wires (two for the primary, three for the seconday of the transformer). I decided not to wire pin 1. The amp jumper is set to bridge mode. Since the amp is external to the subwoofer, I needed two connectors for the amp's output. I mounted a pair of 5-way binding posts from Radio Shack to the faceplate where the Paramount logo sits. I spaced them 3/4 inch apart for use with standard dual plugs. Next to the Peak LED (between the two knobs), I drilled a 1/4 inch hole and mounted a plastic T1-3/4 LED retainer to hold the Power LED. Next to the LEDs, I mounted a SPDT switch. 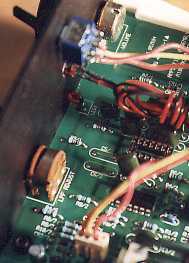 Three wires from the switch were connected to a pair of headers salvaged from the original metal housing (see below). These headers go to the three pins of the boost circuitry. This allows the user to enable or disable the boost rather than hiding this feature on the amplifier PCB. Make sure to mount the boost switch to make sense - up for boost on, down for boost off. The metal casing is from an old Exabyte 8 mm tape drive whose mechanisms have long ago seen the local land fill. The only parts I kept were the 3 sided metal casing and some wiring (see above). For the two ends, I milled endcaps much like the subwoofer (of course !). Each endcap has a solid cherry outer piece and a smaller particle board inner piece. The inner piece is screwed to the outer cap and also to the metal casing. The amplifier module is mouted to the inner particle board pieces with screws. Black spray paint and a clearcoat was applied to the metal casing to match the black Parapix faceplate. 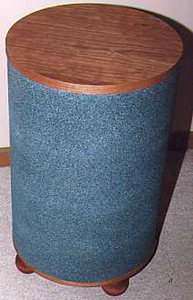 The cherry endcaps received a coating of Danish oil and wax; same as the subwoofer. To test the subwoofer, I used the line level output of my PC sound card (Turtle Beach Malibu) to drive a Rotel amplifier. Later I repeated this test with the Parapix amp. This particular sound card has decent low end extension (see test results at the PC AV Tech web site) so I wasn't worried that it would limit the low end test signal. When I cranked the volume up, I noticed that the tube wall and top endcap vibrated. This should not happen with a tubular enclosure. Adding mass to the top decreased the vibration; sitting on it removed all of it. I concluded that I did not do an adequate job of strengthening the top endcap - there was no bracing, the inner circle was low grade plywood, and as mentioned previously, I had neglected to fill the void where the nuts are hidden. I tried to do what I could short of ripping things apart. I glued the tube to the endcaps, and added carpet padding to the tube walls. This seemed to help a wee bit, but the walls still vibrated. The real solution was to rebuild the endcap. Since I didn't have the time to do this, I decided to place the subwoofer into service and worry about it some other time - hey, this is DIY, which means things are never really done ! No measurements were ever made. Instead I simply listened, looked,and felt the results. It was pretty obvious that the frequency response cutoff was in the mid to upper 20's as predicted. As for SPL, it can definitely crank but it didn't take much to reach the driver's excursion limit. Nonetheless, the SPL at that point is more than enough for HT use in a "typical" room.